The Western Gorilla (Gorilla gorilla) has two subspecies: The Western Lowland Gorilla (Gorilla gorilla gorilla) and the Cross River Gorilla (Gorilla gorilla diehli), both of which are very similar in appearance, with subtle differences found in the skull and tooth dimensions. Western Gorillas are generally smaller than their Eastern cousins with shorter hair and longer arms. They tend to be lighter in colour and have a reddish chest and crest adorning their heads. They can climb trees but spend much of their time on the ground, and build nests to sleep in, mostly on the ground, but occasionally in the lower branches of trees. The Cross River Gorilla is the world’s rarest great ape with estimates suggesting fewer than 250 remain compared to the Western Lowland Gorilla whose numbers are much higher, estimated to be in the order of a few hundred thousand. Both species are critically endangered. The Western Gorilla inhabits tropical forests and swamps in lower altitudes of Western Africa compared to the Eastern Gorilla who can be found in the lowland tropical forests of East Africa. The Cross River Gorilla are restricted to the top of the Cross River, Nigeria, after which they were named, and in the proposed Ebo National Park in Cameroon. The Western Lowland Gorilla consumes parts of at least 97 plant species, with their diet containing that of predominately fruit with leaves, seeds, stems, termites and caterpillars. Due to the Cross River Gorilla not being as well studied as the other subspecies, their diet has only been studied through their faecal matter and are believed to be very similar to that of the Western Lowland. Illegal poaching remains the largest threat to this species and mostly comes in the form of hunting for bushmeat. The second major driver for Western Lowland Gorilla decline is infectious disease, specifically Ebola virus (EVD). Habitat loss is emerging as a major threat to Western Gorillas. As oil-palm plantations in Asia reach capacity, Africa is becoming the new frontier for this crop, resulting in habitat disturbance and forest resource extraction. 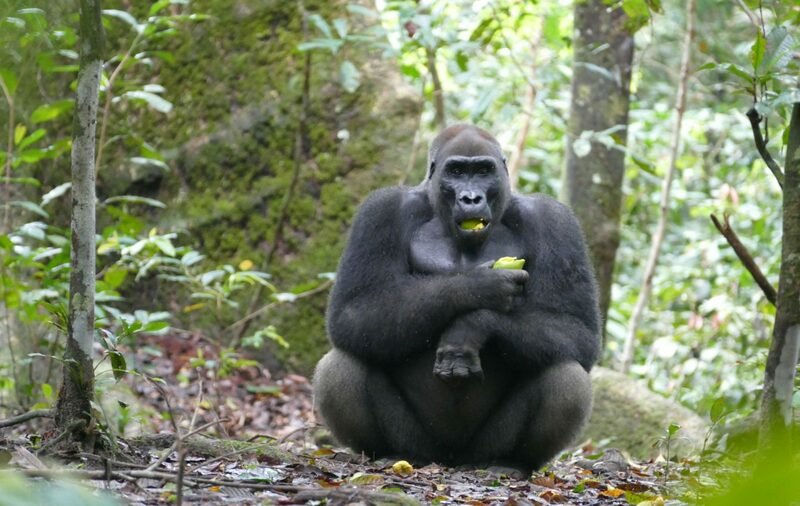 Climate change will affect both sub-species of the Western Lowland Gorilla and is already thought to be affecting the Central African tropical moist forests. The Western Gorilla is protected in all habitat countries by national and international laws, however the enforcement of protective legislation is inconsistent or lacking throughout much of their range. 58% of Western Lowland Gorillas and 78% of their range are unprotected and highly vulnerable to poachers. 30% of Cross River Gorillas occur outside of protected areas, their population is small and fragmented, and their habitat is surrounded by some of the most densely populated human settlements in Africa.